Having completed sea trials in November and received a Certificate of Class from Lloyd’s Register, Belgian shipping company Compagnie Maritime Belge (CMB) has launched the world’s first hydrogen-diesel passenger shuttle, Hydroville. 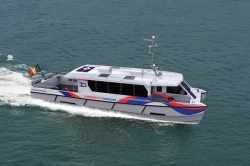 The demonstration vessel is designed to showcase the use of hydrogen to power vessels and will act as a commuter shuttle for CMB employees between Kruibeke, in East Flanders, along the river Scheldt to Antwerp. The vessel features two dual-fuel combustion engines and 12 hydrogen tanks, as well as two diesel tanks for ignition and backup fuel. It measures 14m (46ft) and is capable of carrying up to 16 passengers and two crew members. It has a top speed of 31mph (50km/h) and will offer a total capacity of 441kW thanks to the dual-fuel propulsion system. The vessel will rely on hydrogen for the majority of its passage, and the diesel will reportedly be used for ignition, pilotage and backup fuel in emergencies. 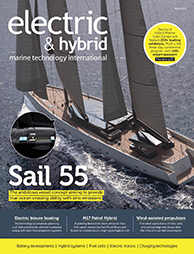 The Hydroville is a pilot project to test technologies for larger hydrogen-fuelled vessels. The company said that it opted for combustion engines because batteries or fuel cells are less suitable for heavy transport (such as ships and aircraft). “The batteries required for an application of this kind would be so huge that their cost and weight would make them economically unfeasible. The time it takes to charge that kind of battery would be problematic as well. Fuel cells offer more possibilities in that area, but the high cost makes them less suitable for large-scale commercial transport,” the company added.